CSS is part of the BioWatch environmental sampling team in EPA Region 5. The BioWatch Program, established in 2003, is managed by the Department of Homeland Security (DHS), Office of Health Affairs (OHA). It is an early-warning system for detection of five biological agents that can be intentionally released into the air. The BioWatch Program is operational in more than 30 of the largest metropolitan areas in the U.S. 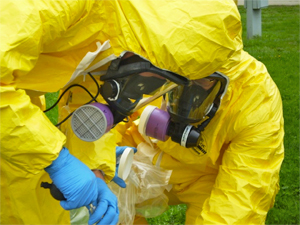 The detection of a biological agent by the BioWatch system is referred to as a Biological Actionable Result (BAR). Public health officials use a BAR to initiate a situation assessment and make an early transition to appropriate emergency response, medical care and consequence-management plans. The combination of early warning and rapid public health response may mitigate the potentially catastrophic impact on the population. If a credible biothreat is detected in EPA Region 5, then the agency may be called in to assist with the response. Our staff have been involved with developing sampling procedures for biological agents for more than 15 years. CSS staff are considered to be subject matter experts in sample collection. The primary goal of environmental sampling during an initial BAR response is to provide decisionmakers with a more accurate situational assessment of the BAR to help refine public health response actions and to enhance situational awareness and support informed decision making by BioWatch jurisdictional public health leadership. CSS staff have also worked with EPA On-Scene Coordinators (OSCs) to prepare and present a field/classroom course and exercises to prepare for an emergency response to a biological agent. The course included instruction on collection of samples, health and safety, PPE, proper planning, basics of biological agents and logistical planning.